How's your PC running now? You know, it's weird, because even though things are much better than they were a few days ago, I still get the occasional pop up, and every so often, I get this bumping sound that I can't quite describe. It's the same sound you get when you're prevented from deleting a file. Also, every time I run the Ewido online scan, it seems to find the similar issues each time, though I delete them after each scan. The followiing is the latest Ewido log. What does the pop-up say? Give me some information on ir or a screen shot of it. Those are cookies, and they will be created anytime you are on the interent and go to any site. They are nothing to be alarmed about. In that case, I believe I'm almost back to normal apart from the weird bumping noise. Did you get any information on the Pop-up? What does it say? Just standard advertising pop ups here and there. Select Start ->> Run ->> type in combofix /u (there is a space between x and /) Then O.K. Your Java is out of date. Older versions have vulnerabilities that malware can use to infect your system. Please follow these steps to remove older version Java components and update. Java Runtime Environment (JRE) 6.u11. 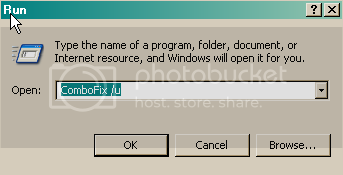 Then from your desktop double-click on jre-6u11-windowsi586-p.exe to install the newest version.